Immerse yourself in Sri Lankan life. Exploring the open air bazaars and markets, visiting temples and playing with elephants, this itinerary has it all. You’ll see the stunningarchaeologicall sites in Anuradhapura and experience an elephant back safari. You’ll have a chance to sample traditional Sri Lankan food in a cooking demonstration and visit the Temple of the Tooth Relic – which houses Sri Lanka’s most precious relic, the tooth of the Buddha. The trip is capped with a 4X4 Jeep Safari to visit Yala National Park where you’ll be immersed in incredible wildlife. We believe in giving back to the community, which is why whenever you book a holiday to Sri Lanka we sponsor a child’s education for 6 months. We work with a local charity to help provide the resources and funding to make a difference to a child’s life and give them a better start and a brighter future. When you arrive, your driver will pick you up to take you to your hotel. In the afternoon you’ll be given a city tour of Colombo. Your drive through the city will take you to the Fort and Pettah – a series of open-air bazaars and markets – and the tree-lined Cinnamon Gardens. You’ll also visit the Hindu Temple at Sea Street, lined with goldsmith shops, the Dutch Church at Wolfendhal, dating back to 1749 as well as The Independence Hall, see the replica of Avukana Buddha, the Independence Square and Gangarama Temple. After an early breakfast, you’ll visit Pinnawala Elephant Orphanage. It is home to around 90 elephants, some of which are baby elephants found abandoned or orphaned in the wild. Then it’s a few hours drive north to Anuradhapura. After breakfast, you’ll visit the stunning archaeological sites in Anuradhapura. Anuradhapura was the first capital of Sri Lanka, famous for its well-preserved ruins of ancient Lankan civilization. 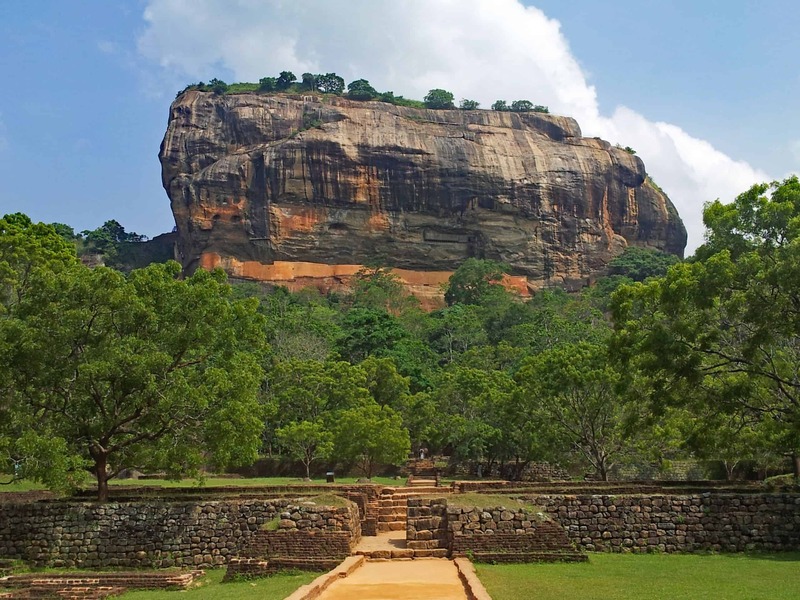 From the 4th century BC, it was the capital of Sri Lanka until the beginning of the 11th century AD. During this period it remained one of the most stable and durable centres of political power and urban life in South Asia. You’ll also see the oldest historically documented tree in the world, Sri Maha Bodhi (Sacred Bo-Tree). It is the tree under which the Buddha, Siddhartha, became enlightened and is over 2,300 years old. You’ll see the Samadhi’ Buddha statue (4th century AD), one of the most famous statues depicting the Buddha in a state of ‘Samadhi’ deep meditation. You’ll then drive to the ancient city of Polonnaruwa and visit the UNESCO World Heritage site, another fundamental and important site in Buddhism. After breakfast experience the thrill of an elephant back safari in Habarana. Once on the elephant, you will be taken deep into the jungle, accompanied by a mahout. During the journey, you will likely spot herds of wild elephants on this adventurous journey. Then experience a bullock cart ride in Habarana followed by a chance to see a cooking demonstration as well as enjoying a tasty village lunch with vegetables picked from just metres away. It’ll be cooked and served in traditional village style on banana leaves. In the afternoon return to Sigiriya and climb the Sigiriya Rock Fortress before visiting a Batik Factory where you can see the manufacture of beautiful batik prints. After breakfast head south to Kandy. En route you’ll visit the Dambulla cave temples and a spice garden in Matale. Dambulla is famous for the five cave temples on a rock which was donated by king Walagambahu in the 1st century BC to Buddhist monks. All five caves’ walls and ceilings are covered with Buddhist murals and there are more than 130 Buddha statues, statues of Gods and Kings also found here. At the Spice Garden at Matale you’ll see the luscious cinnamon, cardamom and pepper plants as well as being able to purchase authentic local spices. If you like you are able to have a Sri Lankan style homemade lunch at the Spice Garden. In the afternoon in Kandy you will visit a gem factory where you will see gems of all types that are found in Sri Lanka and observe the skilled workers cutting and polishing the jewels. You will also visit the Kandy Garrison cemetery. It’s a beautifully kept garden cemetery founded in 1817 for the internment of British-era colonists and is managed by the Commonwealth War Graves Commission. You then have the option to visit the cultural show in Kandy to watch traditional dancing and performances. 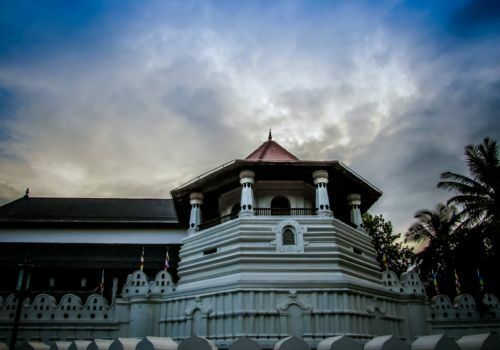 After breakfast, you’ll visit the Temple of the Tooth Relic. Considered Sri Lanka’s most prized possession the sacred tooth of the Buddha has been one of the most visited shrines in the country. After time at the temple, you’ll visit a tea estate and factory en route to the “Little England” of Sri Lanka, Nuwara Eliya. Set against beautiful backdrops of Mountains, Valleys, Waterfalls and Tea Plantations it feels just like England on a spring day although the temperature does drop at night. All around Nuwara Eliya you will see evidence of the British influence. Houses are like country cottages or Queen Anne style mansions. Nuwara-Eliya also has one of the finest 18 hole golf courses in South Asia. In the afternoon it’s time for a 4X4 Jeep Safari to visit Yala National Park. A haven for fauna both indigenous and migrant, this park is famous for elephants, leopards, bears and a bask of crocodiles. You’ll also see thousands of flamingoes, assemblies of spotted billed pelicans, spoonbills, cormorants and various species of herons. Pheasants and peafowl are found in their hundreds. Wild Buffalo and herds of wild elephants are a common sight. A truly magical experience. Today it’s an early start from Yala to head to Galle. 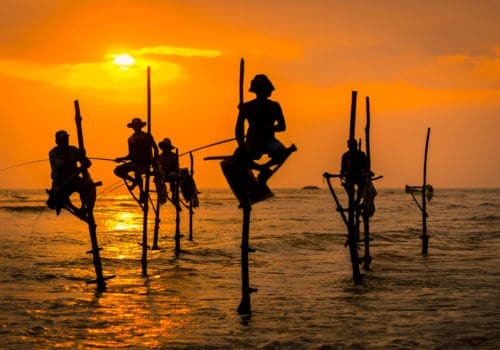 On your way, you’ll witness Sri Lanka’s famous stilt fishermen – men in the water on stilts balancing to catch fish. You’ll then visit the Galle Dutch Fort. Designated a UNESCO World Heritage Site, it’s rich in history having passed through Portuguese, Dutch and British hands. You will then be driven from Galle to the airport for your overnight onward flight.